Here is an ancient philosophical puzzle (in slightly modernized form): Cartman is captain of a pirate ship. To motivate his crew he swore that even if the ship sinks he will remain loyal and stay on the ship, and, if it comes down to it, drown with it. His crew, Ike, Clyde, and Butters, are responsible for the maintenance of the ship. Week after week they check the ship for rotten planks and occasionally replace a plank. Eventually they have replaced all the planks. Butters, not the brightest of the bunch, decides to reassemble the decommissioned planks and build his own pirate ship. Once finished, he gets on his own ship and sails out of the port. It takes only a few hours and the ship, built solely from rotten planks, sinks. Cartman finds himself in a difficult situation: must he throw himself into the sea and drown with the ship Butters reassembled from the rotten planks in order to honour his vow, or can he stay safely on his own pirate ship? Is the original pirate ship identical with the one reassembled from the rotten planks, or is it identical with the one safely anchoring in the port? Cartman, interested in his own survival, argues that it is identical with the ship in the port; Ike, sensing an opportunity to become captain himself, argues that it is identical with the sunken ship. Who’s right? This question has given rise to many metaphysical debates among certain philosophers. But other philosophers and many non-philosophers have little patience for such questions. They smack of verbal sophistry: we feel we know all the facts, it’s just a matter of deciding what exactly we mean by “identity” and how we want to describe these facts. Many other philosophical questions feel similarly shallow, albeit perhaps to varying degrees: what is free will? What is meaning? What is an action? What is a law? What is art? In general, many “what is X” questions generate the feeling that they are shallow or purely verbal. If Hume is right and what keeps many philosophical disputes alive is a lack of agreement on the meaning and use of word, it would be great to have some kind of tool to detect such verbal disputes so we can avoid them and focus on the real questions. This captures nicely what many of us feel when confronted with the disputes in the last section. And it gives us at least a very rough guideline for finding verbal disputes, namely that it feels like the two parties are not really disagreeing. Unfortunately, judgements on whether two parties really disagree do not always converge, as the species problem and the debate about the ship of Theseus show. Can we do better than just our intuitive feeling about a dispute? Chalmers suggests the method of elimination, a three step method for detecting verbal disputes. Suppose you disagree with a person on the truth of a sentence S, potentially due to a disagreement over the meaning of a term T.
Step 1: Ban the term T temporarily from your vocabulary. Step 2: Try to find a new sentence S’ in the restricted vocabulary such that the parties nonverbally disagree over S’ and this disagreement is part of the dispute over S.
Step 3: If there is such a sentence S’, then the dispute is not completely verbal, or at least there is a non-verbal dispute in the vicinity. The two parties put forward various arguments to support their position. A stresses that it took absolutely no skill to write these lines and then take a screenshot of the post. B points out that the screenshot has been sold for $90,900 at an online auction. 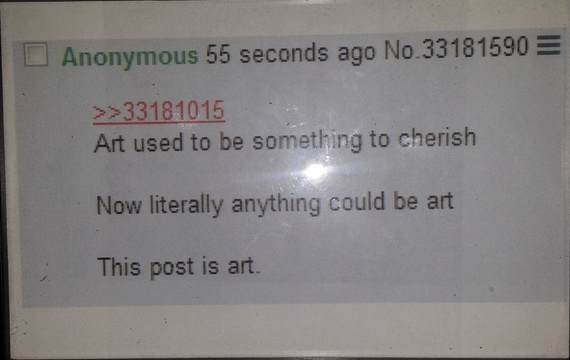 A argues that plenty of non-art is being sold for much money and that that art is necessarily unique whereas a screenshot is not, it can be copied just like that. And so on. Now let’s ban “art” from the discussion. Can we find any other sentence over which A and B disagree? It doesn’t look like it – both know perfectly well that it’s just a screenshot, that it sold for an impressive price, and how much skill it takes to type these words with a keyboard, or come up with the words. Hence they are engaged in a merely verbal dispute. If that is right, then much of the debate on the ontology and metaphysics of art is completely misguided and rests on confusing semantic questions with factive questions. Many other debates might be in the same boat and should be abandoned instead of solved. But sometimes there are substantive disputes in the vicinity. “What is free will” for example might be a purely verbal question, but for each conception of free will it could turn out to be a substantive question whether it is necessary for legal or perhaps moral responsibility. Occasionally even verbal disputes can have important consequences and need to be resolved instead of just diagnosed. There is at least one case where we can put a price tag on a verbal dispute: $3.5 billion. That’s the amount of money at stake in the legal battle between Swiss Re and the leaseholders of the World Trade Centre after the double-attack on the twin towers in 2001 over the right definition of “occurrence”. A New York appeals court ruled in favour of Swiss Re and decided that the attack on the two towers constituted a single occurrence, thereby reducing the insurance company’s liability significantly. Sidelle, A. (2007). The method of verbal dispute. Philosophical Topics, 35(1/2), 83-113. Unger, P. (2014). Empty ideas: A critique of analytic philosophy. Oxford University Press. Unger, P. (2014). Philosophy is a Bunch of Empty Ideas: Interview with Peter Unger.